There were few changes here. One big addition though was that psychologists do not deny employment or benefits to another psychologist solely because they have been the subject of an ethics complaint. This would seem to stem from the legalistic nature of our society, and the increasing roles and risks for complaints psychologists face. These sections of Standard 1 relate to being sure our work is used and interpreted as we meant for it to be in order to avoid harm to others. To ensure that we are able to do this, we have to be prepared to look closely at what people want from us. Sometimes we come into conflict with those who want us to use our expertise and knowledge to answer questions we can not answer, to provide advice in complex matters beyond our competence, and to support positions that our work does not support. To prevent our work from being misused, we have to state our ethical responsibilities clearly, explain the conflict, and try to work out any disagreements with courts and organizations. This is not a matter of negotiating ethics. Rather, it is a matter of explaining our obligations and finding a way to meet them. For example, when asked to surrender psychological tests and the manuals that explain their use to the court, we could explain that to do this is to violate intellectual property laws as well as compromise the security and the clinical utility of the tests. Perhaps we could answer the court’s questions another way? Perhaps we could give samples of questions not on the test, but that would still give the court a sense of what the test does and how it does it? When we see problems in our colleagues’ behavior, we should say something. Often, however, things are not what they seem or what people say they are, so we are ethically charged to try to informally investigate and resolve the matter first. This gives us a chance to find out the facts before possibly over-reacting, and perhaps to advise others on an ethical conflict they may not have perviously seen and correct it themselves. When harm is being committed, however, informal resolution may not be appropriate, and instead a report to a superior or an ethics committee is needed. Such complaints, as we will see below, are taken very, very seriously, and should not be made lightly or carelessly. 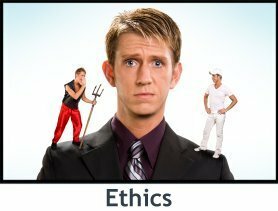 In fact, filing ethical complaints carelessly is in itself unethical. Likewise, while someone is being investigated, we do not “assume guilty until proven innocent.” Rather, we suspend our judgments until we have sufficient information upon which to make a sound judgment. 284 participants were randomly selected from the October 1995 roster of psychologists provided by the Texas State Board of Examiners of Psychologists. Using a 6-point scale ranging from 1 (never) to 6 (always), respondents rated 24 events and activities as to the likelihood of a complaint and malpractice lawsuit being filed. Respondents failed to recognize as potential sources of malpractice litigation incorrect diagnosis and negligent clinical supervision. Most important risk management activities included release of information forms, case documentation, and informed consent procedures. 65.4% reported attending a continuing education or professional workshop dealing specifically with risk management, malpractice concerns, or ethics. Peterson writes about how ethical complaints pose a significant risk for the destruction of a psychologist’s career, professional reputation, and financial wellbeing. He was a psychologist with 25 years of experience who made an error in judgment and had an ethics charge filed against him. “Three years later, I received a report of findings that lacked factual accuracy, seemed bent on proving my guilt, selectively collected and used information to prove the case, and rendered an extremely harsh punishment.” He fought it for six months, his legal fees had reached five figures, and eventually he surrendered his license, as he was retiring, rather than fight it any longer. He wrote his article to raise awareness of the problems with state and provincial psychological associations (SPPAs). He explained how in 1999, Division 31 offered a symposium in which panelists discussed “egregious mistreatments” of some psychologists by licensing boards, and showed a video documenting “suicide, emotional and health-related disabilities, loss of income from unfavorable publicity, and financially catastrophic legal bills” that resulted from ethics charges. Three times a psychologist appealed the findings of the licensing board, and got the ruling overturned by an administrative law judge, but the licensing board refused to accept this and revoked his license. This cost between $100,000 and $200,000. A licensing board charged a psychologist violating new standards, while old standards had been in effect at the time of the “infraction.” They refused to reopen the case when this was pointed out, and instead of spending $40,000 on an appeal, the psychologist gave up his license. A psychologist went with a patient to an art show to see a piece the patient had submitted and was charged with violating the client’s boundaries. Peterson says three former chairs of licensing boards admitted to him in confidence that typically licensing boards assume the psychologist is guilty unless proven innocent. A licensing board used testimony from a civil suit without giving the psychologist a chance to review it prior, or similarly hearing the psychologists’ testimony in the suit. A psychologist reported that he was threatened by an assistant attorney general that if he publicly protested the actions of the licensing board that new charges would be brought against him. Peterson calls those who speak up “brave souls” and says those investigated by ethics boards are “so shattered and wounded by the actions of the complainant that they withdraw and don’t protest inappropriate and unreasonable treatment.” He notes peers and colleagues fail to support them, assume their guilt, and SPPAs don’t know or get involved in the case. He suggests we “practice what we preach” and suspend judgment when a colleagues has charges filed against them. The participants of this study were 240 licensed psychologists and master’s level psychologists in a southern state who had complaints filed against them with the state board during a 56-month period. Five reported spending between $180 to $30,200 to consult with other psychologists, and spending $0 to $35,584 on attorney fees. Those who violated an ethical standard spent on average seven times more on average compared to non-violators ($750 vs. $5,450). Only a small percentage were sued, with violators again being seven times more at risk (14% vs. 2%). These suits added an additional $1,000 to $25,000 to their attorney costs. Both groups felt they were treated in a punitive, unfair, and even abusive manner. Both complained they were assumed to be guilty and treated as a “criminal”, with 66% of the violator group and 21% of the non-violator group stating their treatment was discourteous. Boards were seen as especially unfair when they gave psychologists only 10 days to respond to a complaint, but themselves took as long as they wished. Williams cites six situations that can lead to false allegations: (a) malingering and fraud, (b) revenge, (c) psychopathology, (d) “recovered” memory, (e) doctrinaire suggestions from a subsequent therapist, and (f) escape from unwanted treatment. The plaintiff claimed that she had been so depressed that she could not work out at her gym. A private investigator hired by the therapist documented that she did go to the gym and work out, however. Despite this, the jury found for her and awarded large damages, with some commenting that they expected that a malpractice insurance company would pay for it all. In 1998, child custody evaluations constituted 11% of all ethical violations, compared to 58% for sexual misconduct. Among the 34 states and provinces participating, 2,413 complaints filed in child custody cases, with only 27 leading to findings of formal fault against the psychologist. The psychologist may have had a relationship (professional or otherwise) with one member of a couple prior to treatment and not have disclosed this, or may have collaborated with a client on a book or presentation which later developed into a conflicted relationship. The psychologist said things to the client that were considered by the client to be offensive or harsh. What is a therapeutic confrontation and what is abuse? It’s hard to say in some cases; certainly things can be taken out of context, but some reported comments certainly have appeared to abusive. A second evaluation by a psychologist points out flaws and inadequacies in a previous evaluation due to inappropriate use of tests, outdated tests, or incorrect interpretations of the tests… and ethical complaints are filed against the first psychologist. Threats to terminate a client, refusal to provide services for failure to pay even during a crises, and appropriately terminating with a client but this being poorly received by the client. This can be hard to define, but using new techniques without adequate training and consultation, for example biofeedback or hypnosis, can lead to malpractice complaints. The psychologist may have billed for services not provided, altered the fee for the insurance company, lied about the length of sessions, billed for testing that was not administered, or provided receipts of billing for the client that differed from what was submitted to the insurance company. The psychologist does something like leaving the door open while discussing confidential information, abandons the supervisee, or engages in sexual harassment or dual role relationships with the supervisee.